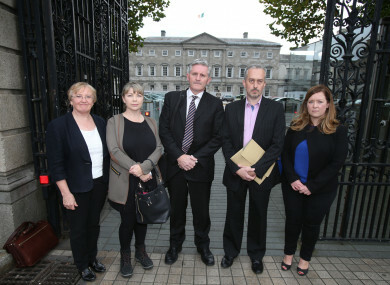 A group of tracker mortgage scandal victims, with financial adviser Padraic Kissane (centre) after a hearing in Leinster House. BANKS THAT OVERCHARGED their customers have paid out €647 million so far in redress and compensation as part of the tracker mortgage examination. The Central Bank today gave an update on its examination of the scandal, which saw tens of thousands of customers being overcharged when they were either denied a tracker rate they were entitled to or charged the wrong rate of interest. The regulator has revealed that it has identified an additional 1,400 affected customers, bringing the total now to 39,800. At least 71 customers loss their homes as a direct result of their bank’s failings and there was loss of ownership in respect of a further 142 buy-to-let properties. It said at the end of 2018 lenders had paid out €647 million to customers affected by their failings – an increase of €67 million since the end of August. The majority of affected customers (97%) have now received an offer of redress and compensation. The Central Bank said that while the vast majority of affected customers have been identified, there may be some additions to this as the supervisory phase of the examination nears completion. A final report expected to be published in the coming months. There are also a number of enforcement investigations with some expected to conclude this year. Derville Rowland, director general of financial conduct in the Central Bank said the work of the examination has “always been about ensuring that lenders identify, redress and compensate affected customers for the wrong which they caused”. Email “Banks pay out €647 million to victims of tracker mortgage scandal ”. Feedback on “Banks pay out €647 million to victims of tracker mortgage scandal ”.